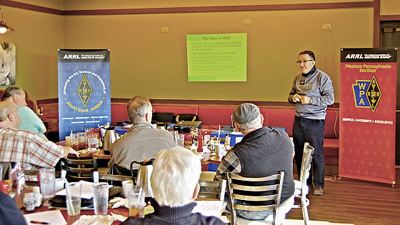 Our Western Pennsylvania Section Cabinet met on Saturday, February 2nd at Kings Restaurant in Kittanning. Ten Section Staff Members were present, and each one gave a report on their activities and plans. Additionally several Staff Members had prepared briefings on new technologies and programs, which they presented to the group. WPA ARES Simplex Frequency re-alignment plan was discussed and approved. A suggestion by the Western Pennsylvania Repeater Council that the WPA Section petition for a 70 cm Repeater pair to be designated as “Shared, Non-Protected” (SNP) for use by WPA ARES section-wide by temporary repeaters during disasters, training exercises and public service events in need of repeaters was discussed and approved. Following a presentation on DMR digital voice radio, the use of DMR in our WPA section was enthusiastically discussed. A Section position of encouraging the static linking and greater use of the “Western Pennsylvania” DMR Talk Group 31422 by WPA DMR Repeaters and hotspot users, and the institution of a regular DMR net was approved. Official encouragement for WPA ARES members to report their service hours for Public Service Honor Roll (PSHR) credit to our WPA Traffic Manager, and promoting further integration with ARES Connect was discussed and approved. Enhanced support and encouragement for County ECs who are building or rebuilding ARES teams under the new Enhanced ARES program was discussed and approved. Renaming WPA Districts with “Plain Language” names: North-1 becomes “Northwest”, South-2 becomes “Southeast”, etc. was discussed and approved. Formation of a “special needs” VE team, trained in providing appropriate accommodations to prospective radio amateurs of all ability levels was discussed and approved. Travel reimbursement policies for 2019 and need for Section Approval before incurring expenses was explained to the group by the Section Manager. Discussion of a possible change in our WPA Section Convention venue was Deferred, since the 2019 WPA Section Convention was already approved by ARRL. Support for only one single group that will be responsible for planning an officially sanctioned Special Event station and activities for the KDKA 100th Anniversary in November 2020 was discussed and approved. More Official Observer assistance in several FCC investigations of very serious Amateur Radio violations in WPA was discussed and approved that the OOC instruct Official Observers to allocate priority for these issues. The establishment of a “Speaker’s Bureau”, listing amateurs willing to travel to put on interesting and competent presentations at Affiliated Club meetings was discussed and approved. The Cabinet Members approved that remaining Staff vacancies to be filled, and requests be made for qualified volunteers; that the Section Manager should require regular reporting from all Section Staff, and to require the Section’s prior approval and coordination of official WPA Events and activities. Guidelines for conflict-of-interest situations were discussed. Demonstrations of DMR technology, and the design and operation of Software Defined Radios, with examples of each were presented. QST QST QST – ECs and DECs should continue to report as usual. We will transition over to reporting through ARES Connect later during 2019. 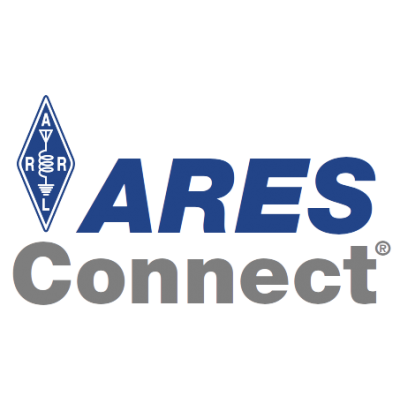 Q – Do you need to be an ARRL member to sign up for ARES Connect? A – No, participation in ARES, and ARES Connect, does not require ARRL membership. Q – Are ARES Connect registrations replacing FSD 98 applications? A – Yes, the current form FSD 98 will be phased out in 2019. ARES Connect allows admins to generate reports, in the form of spreadsheets, to compile reports as they see fit and in real time. Q – It would make sense for each ARES member to complete their own profile and update it as changes warrant. Is this correct or is this something I as EC must do? A – Users can edit their profile at any time. Individual volunteers should create and manage their own ARES Connect accounts. An EC should only create and manage an account for volunteers who make it clear they do not want to. Q – As EC, why don’t I have permission to edit my county ARES members. A – At this time permission to edit users is given to section level admins and above. If you need to make a change to a user account, contact your SEC or SM. We will be reviewing this policy which has implications of a security nature and determine how we might return the ability for ECs to edit users. User names – All users should use their Amateur Radio call signs as their user name. ARESMAT (mutual aid) operations will be greatly simplified by programming all four of these frequencies into every radio used by ARES members. This plan enables every radio to be used in every county in the WPA Section without the need for any re-programming in the field. This Plan was shared with all DECs and ECs for comments in late October 2018. It was also shared with the Western Pennsylvania Repeater Council for comments and suggestions. We gratefully acknowledge their suggestions, which bring it into conformance with the ARRL and WPRC bandplans, and the current operating practive on 2 meters throughout our entire Section. When the FCC moved to make DMR legal for Amateur Radio use in 2014, it stimulated a lot of interest in the commercial radio mode (also known as “MOTO TRBO” by Motorola). As an open standard, DMR is picking up momentum as new models of radios by new manufacturers are starting to flood the market. Many of the big names are FCC type accepted for Part 90 (Business band) and Part 95 (CB, including GMRS and MURS), but before buying that super-bargain priced radio, make sure it is legal to be purchased in the US. 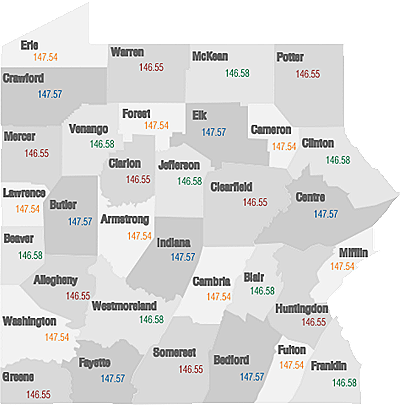 As of this writing, there are 75 amateur repeaters in Pennsylvania that support DMR. Only 19 of them are on the air in our WPA Section, though. For well under $100, you can buy the parts to assemble a DMR “Hotspot” (or purchase a ready-made one) which uses your Internet connection to link your radio to the global DMR Networks. If you and a buddy both have DMR radios, you can also use TalkGroup 99 on 145.79, 441.00 and 145.61, 145.63, and 145.65 MHz. Please do not use DMR on 145.51, even though the Internet says you should. In our WPA Section, our Repeater Council Band Plan has 145.51-.59 assigned as FM Simplex frequencies, and our WPA ARES Plan is in total alignment and agreement with the WPRC existing bandplan! Due to the low price of the equipment, it is relatively easy and inexpensive to add DMR capability to almost any existing amateur radio repeater. Due to the currently small (but growing) number of DMR repeaters in WPA, activity is not as intense as it is elsewhere, like Eastern PA, Ohio and the whole eastern seaboard! But, we do have a “Western PA” talkgroup number: 31422. There has been some talk of a regularly scheduled net, which sounds like a great idea! Meanwhile, if you have a DMR radio, please make sure you have 31422 in a place of honor in your codeplugs and as a “Static Group” in your Hotspot, and please make a habit of using it on a regular basis. Our WPA Section is encouraging all DMR Repeater owners in our Section to consider “nailing it up” as a Static Group on your DMR Repeaters, thus making it very easy to carry on relevant QSOs with our neighbors in our Section! I monitor 31422 as well as I can, and I hope to see you there very soon.